When one thinks of a school district, a robust social media presence does not come to mind; however, that is not the case of Arcadia Unified. Boasting over 6,000 Facebook followers, 4,000 Instagram followers, and 3,000 Twitter followers, Arcadia Unified and the Public Information Office strive to keep the community informed. In the heart of Arcadia High School’s Media Center lies an integral part of Arcadia Unified’s Public Information Office — the Arcadia Unified School District Digital Communications Internship. Consisting of 25 driven high school interns, the Digital Communications Internship covers school and district-wide events, helps manage the district’s social media, and produces student-made content in the forms of videos, podcasts, and articles for the community to enjoy. Arcadia Unified strives to be innovative, with its motto “Imagine. Inquire. Inspire.” and has spent the past decade implementing personalized learning for all students. “Our vision for Arcadia is to give students agency. In other words, they are in control of their learning, that they have a voice in learning on our campuses and in our communities. So a natural iteration is, ‘Let’s have students participate [and] actually create and tell those stories from a student perspective,’ and at the same time while it is benefitting the school district and the community in getting great stories out, it’s a real experience for them as reporters publishing real content in social media and in the paper,” Superintendent Dr. David Vannasdall said. For the students, DCI opens a whole new door of opportunity for students to gain experience in the professional world. “Whether they go into journalism, marketing, communications, or not, they will have skills that really help excel them in their particular field. We try to give them not only experiences to cover events, but also workshops, bringing guest speakers, and really exposing them to what the real world would be. We’ve covered major events like the Rose Parade, working alongside some of the best [journalists] in the LA market and across the world, attended USC journalism day, and have had all these other amazing experiences,” Foran said. 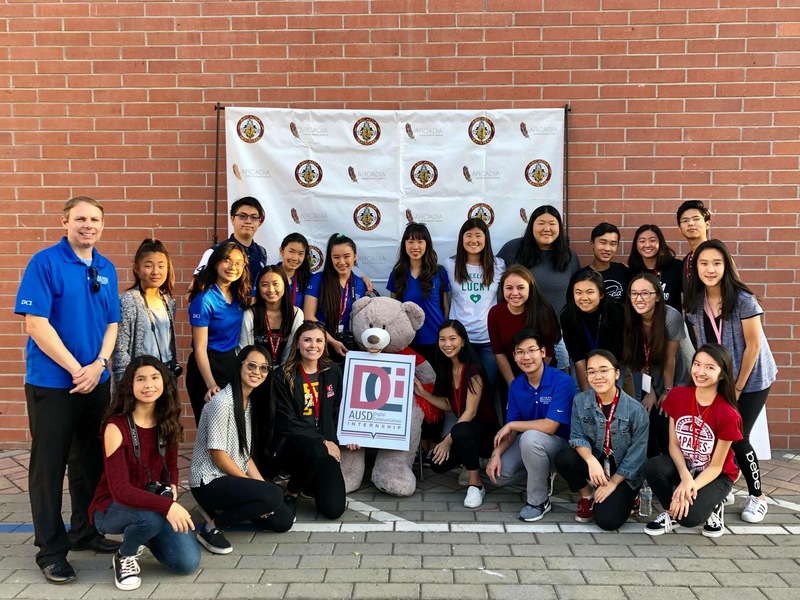 DCI has even been recognized by the California School Public Relations Association for its outstanding work in producing the Chromebook Care video for the district, as well as by Buzzfeed, ranking Arcadia Unified’s Instagram page among the top educational accounts, including college, high school, and elementary, in its “Top 10 Best School Instagram Accounts” list. “There are so many great schools and universities running very creative Instagram pages with world-class photography. It was incredibly rewarding to be recognized among them,” Foran said. As for the community, by following Arcadia Unified’s social media, residents can be better informed about the district and stay up to date on all district news and events. Michael Tseng, a DCI alumnus who has attended USC Journalism Day, USC’s Annenberg Youth Academy for rising journalists, and is a current journalism major on a full ride scholarship at the University of Southern California recalled his positive experience at DCI. For now, DCI continues to publish stories, photos, videos, and podcasts daily on platforms easily accessible to the community such as Facebook, Instagram, and the district website, as well as partnering with the Arcadia Weekly and Arcadia Patch to connect with the community. “To actually have a student voice in the writing of those articles is very powerful. I know when I read something that is written by a student, that voice is special and means something to me,” Vannasdall said.